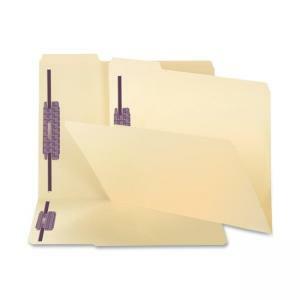 Fastener folders feature SafeShield Coated Fastener Technology - the solution to fastener issues, including papers tears, finger cuts and excessive fastener crinkling. Each folder has two 2" SafeShield Bonded-style coated fasteners in positions 1 and 3. 1/3-cut tab is reinforced and 1/2" high. Folders are made of 11 point stock and are scored for 3/4" expansion.